Indian American musician Sheela Bringi has been exploring the connections between her ancestral and actual homelands her entire life. 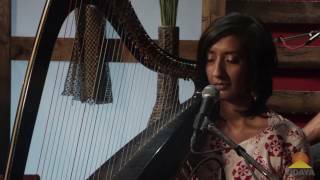 The talented young musician sings and plays a 36-string harp, the Indian harmonium and bansuri (Indian bamboo flute). As a young woman Bringi was influenced by M.I.A. and Dead Can Dance, studied with Cecil Taylor and Meredith Monk, while at the same time deepened her studies with Indian classical masters like Pandit G.S. Sachdev and Ustaad Aashish Khan. This unique background has resulted in her debut album, Incantations (Black Swan Sounds), rooted in India’s classical music tradition and the beauty of its mantras, as well as a groundbreaking exploration of American jazz and blues. The album was released in February 2014 and has garnered praise from National Public Radio, the Guardian, Public Radio International and more. She has performed in a wide range of venues, including concert halls and universities presenting traditional material, yoga studios leading kirtans and in dance clubs overtop throbbing, bass-heavy beats. She’s toured with Karsh Kale, DJ Drez, Dave Stringer and many others. Sheela holds a master’s degree in North Indian Music from the California Institute of the Arts. She teaches courses on mantra and the sacred music of India at Loyola Marymount University’s Yoga Studies Program in Los Angeles, and around the world.